In 1899 Reginald Thornton was admitted as a solicitor, attorney and proctor of the Supreme Court of NSW and set up practice in Balmain. Shortly after, he established a city office and began to act for Manchester Unity. In 1924 he moved into Manchester Unity's new building in Elizabeth Street and in 1933 was joined by his son, Geoffrey, to become R. Thornton & Son. The firm changed its name to Thorntons Lawyers in 1987. Ross Smith and Helen Levy joined the partnership in 1962 and in April 1971, Keith Walker joined the firm and was admitted to partnership in 1972. In 1981 the firm moved to 307 Pitt Street Sydney following the purchase of that building by Manchester Unity. 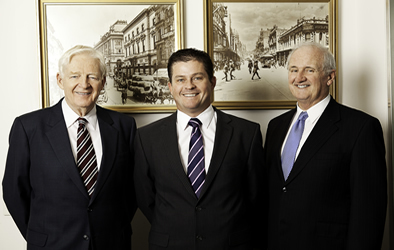 In 1983 Rex Reynolds Baker & Co merged with R. Thornton & Son and John Pollard became a partner. John McKenzie merged his practice with Thorntons and became a partner in 1993. He became senior partner in 2000 after the death of Ross Smith that year. James Grellman joined Thorntons as an employed solicitor in 1998. He became an associate of the firm during that year. Late in 2005 after more than 100 years in Sydney CBD, Thorntons relocated to Forum West at St Leonards. At that time, John Pollard retired from the firm. James Grellman left Thorntons in 2009 to gain further litigation experience with a city law firm. He returned to Thorntons in 2012. Thorntons now comprises three lawyers, being a principal and two consultants together with a dedicated administrative team. We are committed to maintaining our tradition of service since 1899.